We absolutely love it when we see animal best friends hanging out together, and these adorable dog buddies are no different. We value dogs, as “man's best friend,” for the relationships they form with us, but they're social animals that are perfectly capable of finding friends among their own kind as well! Dogs evolved from wolves, and both animals have structured, pack-based social lives. 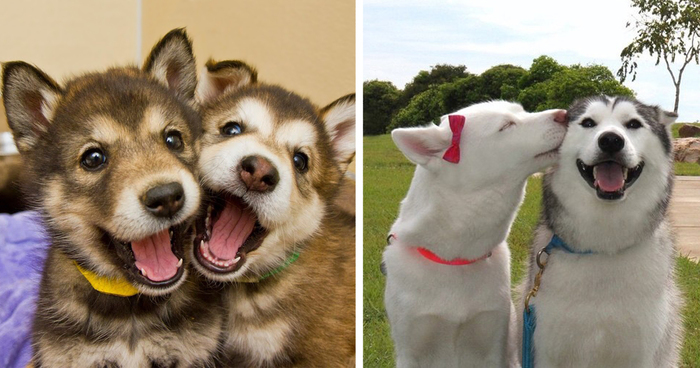 If you have a photo of dogs that are best friends, we'd love to see them! Please add them to this list and vote for your favorites, too. There's just like "WTF is this random blobby thing?!" Adorable! It's Harlow, Indiana and Reese. This will be my corgi soon. His buddy is a shepherd pup and he's growing FAST. I love the beach, and I love dogs! Great combination, great photo! #24 When Will I Grow That Big? "I heard a camera shot, hon"
Treacle is a marvelous name! #48 Let Go... Its Mine! "They're here. Go hide the evidence"
They look like happy sunshine! I'm helping him carry it, Mom. I wish more people would look at all the pics. The later ones get less points!